work for you? Or against you? The PDF and print versions of the Subliminal Communication Test II are the same. One, the PDF version, you download and read on a computer. The print version is shipped to you on paper (it’s the old fashioned kind of book). [Whether you are trying to sell something or get a date…influence an audience or get a job…or just get along with other people, your subliminal messages are more important tha almost anything else. And you always send (and receive) subliminal messages, whether you like it or not. You cannot not communicate. You subconsciously say things about yourself and consciously you don’t even know you are doing it. Perception — how well do you receive and interpret subliminals from others? Persuasion — how persuasive are your subliminal messages? Dissuasion — do you transmit dissuasive messages that block your personal and career success? 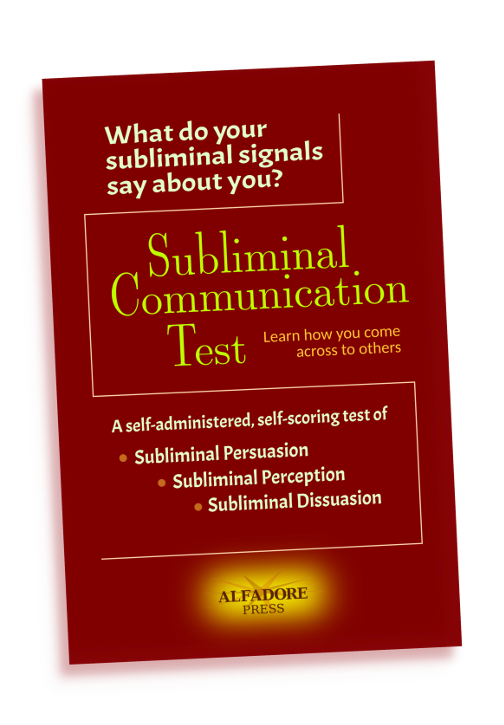 The Subliminal Communication Test II can tell you how well your subliminal communication is functioning. Are you sabotaging yourself? Are you sending messages that spoil what you try to do? Is your career being held back by your subliminal messages? Does your subconscious limit how much you can earn? The test consists of 40 questions. They are answered directly by the subconscious mind through ideomotion. The test is easy to take, easy to score, and extremely informative. Averages of the scores of previous test takers are provided for comparison. After taking this test you will know how you communicate subliminally and what areas need improvement.